I know I haven’t posted for a while but I have been very busy and I’m not the most natural blogger in the world. I thought I’d show you just some of the things I’ve been up to in the past few weeks. The owl is a Cuttlebug embossing folder which has been lightly inked over with Rusty Hinge distress ink. 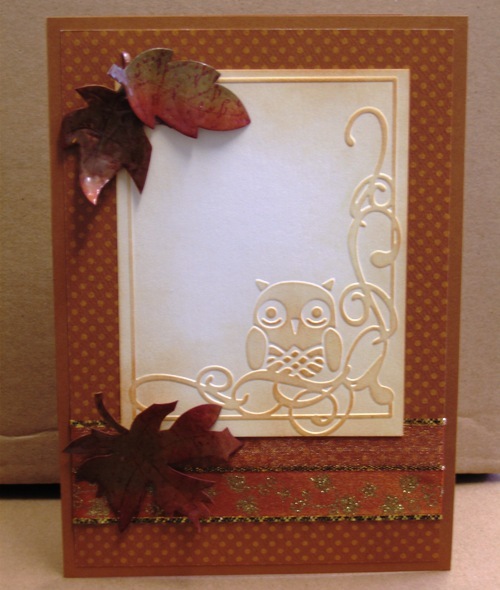 The leaves were quite dull brown card which we coloured with Stazon inks, stamped with a text background, then inked with Versamark and covered in UTEE. They were then processed in the Melt Pot. Much easier than chasing them around the room with a heat gun! This card features Graphic 45 Botanicabella – (some of my fave papers), BoBunny double dot, a Claritystamp verse and glitter peel off leaves. 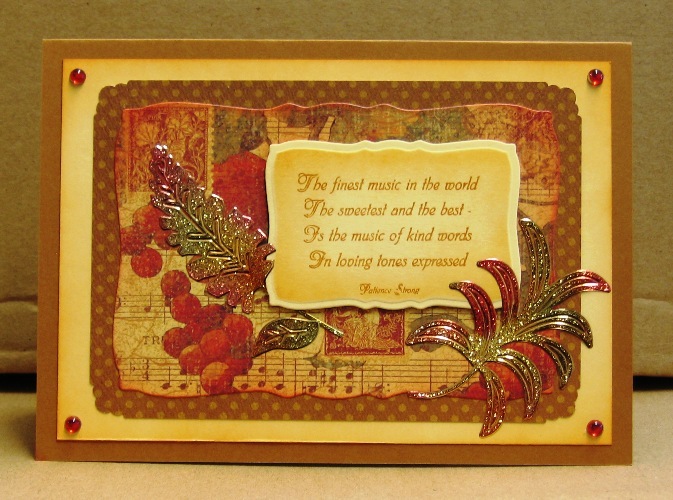 These were coloured with Stazon inks which completely transforms them into these gorgeous accents. The panels were cut using a nestie and some inking of the edges brings them all together. 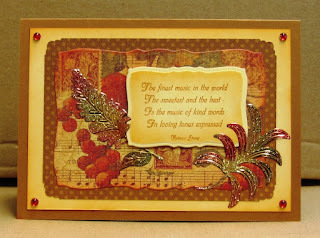 These are two of the three cards we made in one of our Autumn classes. I can’t show you the other one because it is being featured in Simply Cards & Papercraft’s stamping supplement and I sent them the sample but forgot to photograph it, so go & buy the magazine and then you can see lots of lovely samples.